I just started. I will add on as I learn more about having a web site. 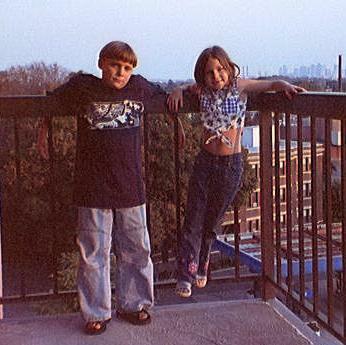 This is me and my sister Kaleigh at my cousin Ron's condo on the seventh floor. This was taken in October '99. We were there for my mom and dad's birthday partys. The Boston skyline is in the background. I am 11 years old now. In November I will be 12. I like pokemon, basket ball, and Nintendo64. and Zelda: Ocarina Of Time. I play the Tenor Saxophone. At my school we have two bands: the regular band and the jazz band. I'm in both! I play High Hopes, YMCA, Wood Chopers Ball, and the James Bond Theme in jazz band. I got the solo in Wood Choppers Ball. Jazz band is really fun! and The Legend of Zelda:Links Awakining. I will put up codes for these and the N64 games often. About these codes I have some now. Pokemon codes: To get 99 of an Item in RED OR BLUE ONLY (not Yellow) get a Poekmon with surf and one with fly. Go to the guy with the coffy problem. Talk to him and say Yes and listen to him teach you how to catch Pokemon. Put the item you want 99 of in the 6th place. Fly to Cinnabar Island and surf on the right end on the black part ONLY!!! It won't work any where else. You will see a pokemon called missingno or M. It will look like a sqare. DON'T CATCH IT IT WILL SCREW UP YOUR GAME!!! Run and check the items, you will find a weird shape next to the 6th item. This site provides history for 10 Ships of Destroyer Squadron 45 during WW-II.